As an illustrator, fine artist, and muralist, Celeste Byers is in high demand. Since graduating with a BFA in Illustration from Art Center College of Design in 2012, she’s worked with clients ranging from commercial giants like American Express to indie magazines like McSweeney’s. 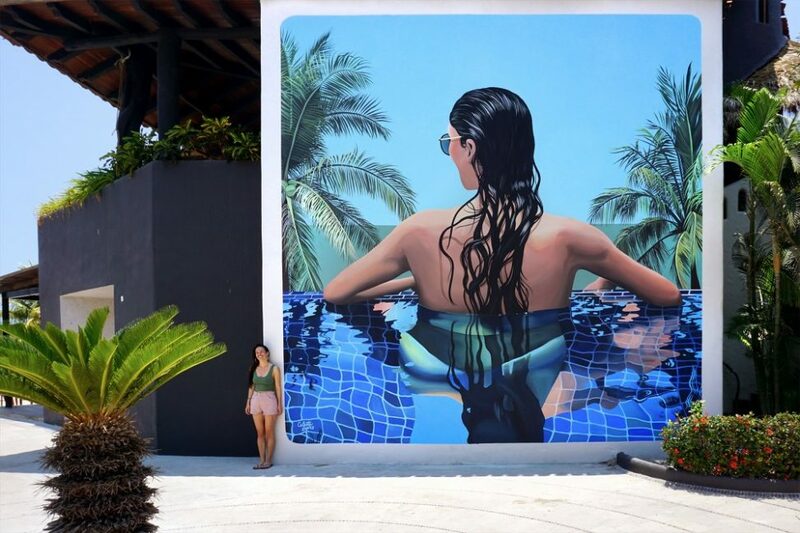 Although she’s based in San Diego, her murals grace walls as far flung as Colombo, Sri Lanka, and, as of recently, the new Thompson Zihuatanejo. With inspiration taken from the natural world and the mystical nature of everyday life, she hopes to remind others of the magic and beauty of our universe. We chatted with her about accomplishments, dreams, and artistic process. 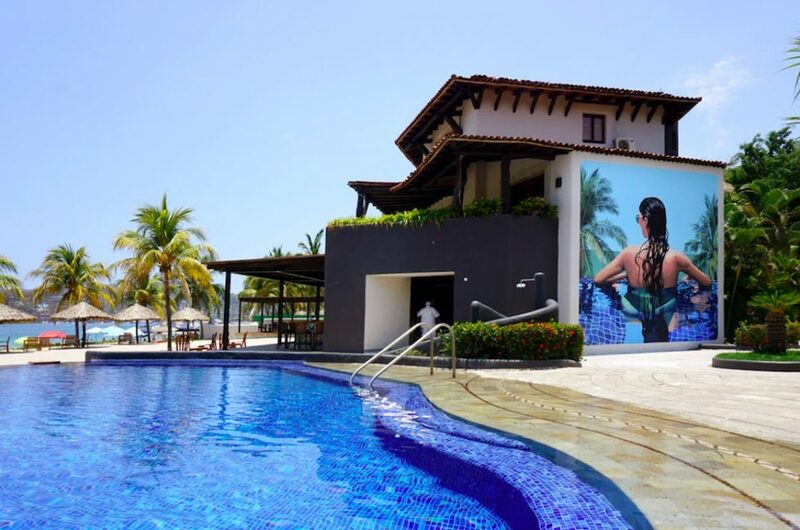 What was the inspiration for the new mural at Thompson Zihuatanejo? 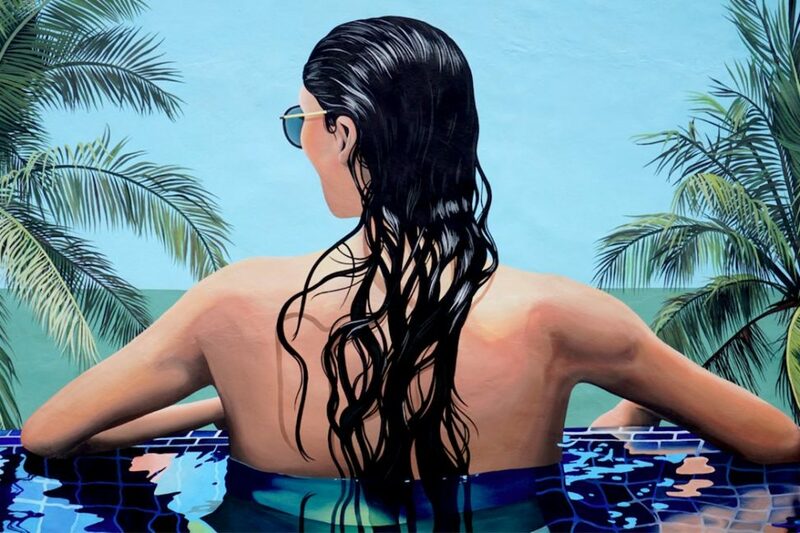 When I arrived at Thompson Zihuatanejo I walked out to the pool, saw the beautiful view, and decided I would love to paint a woman looking out over the view. I found a hotel guest, asked if I could photograph her for my mural, and voilà! The mural concept was born. The traditional process of transferring murals from sketch to wall is usually a numbered grid system, but you have a special process. Tell us a little about it. I usually draw a quick sketch on a piece of paper, then create the composition in Photoshop using a combination of my own photos and found photos to the exact dimensions of the wall. Then I draw out an arrangement of random symbols on the wall, take a picture of it, and overlay the symbols onto my sketch. I use the symbols as a map or grid that gives me reference points of where to draw out my image. Once I’m done drawing the image on the wall, I paint it (usually from top to bottom so I don’t drip paint on what I’ve already finished). In what ways do you think being from San Diego has influenced your work? I think being from San Diego has definitely influenced the colors of my work. Where I’m from is usually sunny, so I’m really drawn to brighter colors with a more tropical feel. San Diego is technically a coastal desert but I think we like to pretend otherwise by surrounding ourselves with palm tree and non-native tropical plants, which I use a lot. In the past few years, you’ve travelled all over the world making art. What project are you most proud of? I’m proud of a lot of my projects for different reasons. I’m proud of the mural I painted for Thompson Zihuatanejo because I think it’s the best rendered mural I’ve ever made. I challenged myself to paint a life-like human and getting the texture of the water right was extremely satisfying. This year I’m proud to be involved in projects with more high-profile clients like the NBA on TNT in collaboration with Amazon, REI, and Facebook. It’s cool to know my work is reaching more people and hopefully it will lead to bigger things. I’m also proud to have worked on a lot of projects related to environmental issues (climate change, the protection of endangered species, marine conservation) and social justice, because it feels good to use my talents for causes I believe in. You work as an illustrator, muralist, and fine artist. Do you have a preferred medium? I like to work in all mediums and switch it up so I don’t get bored or stagnant. There are things to learn from working in all mediums and sizes. I recently learned how to bend neon (as in neon signs) and I have made a handful of experiential art installations as well. It’s always inspiring and eye-opening to learn new techniques and work with different materials. Practicing one thing can make you better at another. For example, this summer I painted so many huge murals that when I was asked to make a smaller one last week I found that I was a lot faster and better at painting than before. That’s a hard question. I feel like a lot of jobs I get are dream jobs that I didn’t even know I had! I love working with anything that I believe is important for the world and any opportunity I’m given to paint whatever I want. I want to get more into transforming entire spaces rather than just walls. If I think really big, it would be amazing to design astronaut suits and rocket ship interiors so my work could be in outer space. What would you most recommend visitors to Zihuatanejo check out? Besides my mural, I enjoyed sunset walks on the beach at Playa La Ropa, the city center at night, the mermaid statue near the town, and the view from anywhere around Ristorante il Mare.